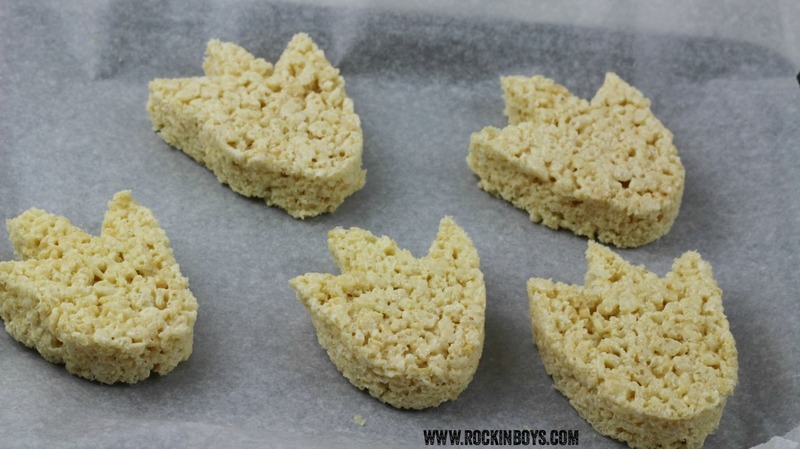 This recipe will yield 8 Dinosaur Feet Treats. Double or triple it to fit the size of your crowd! 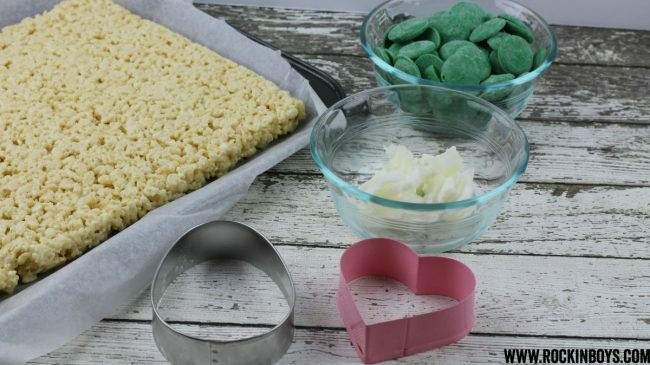 Once they’re cooled, it’s time to turn your treats into feets! 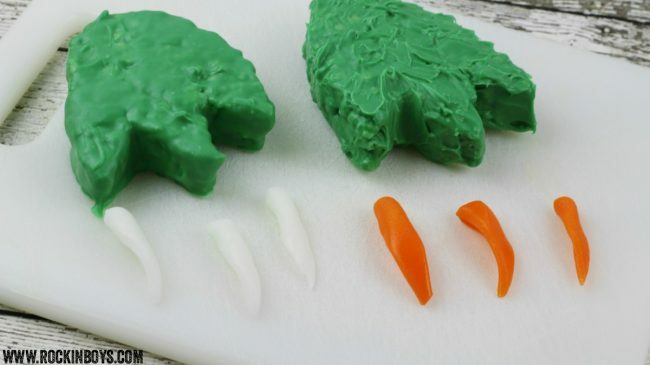 To make the dinosaur toes, take the bottom of the heart cookie cutter and place it into the upper left side of the foot, with the larger part of the oval facing up (see picture). 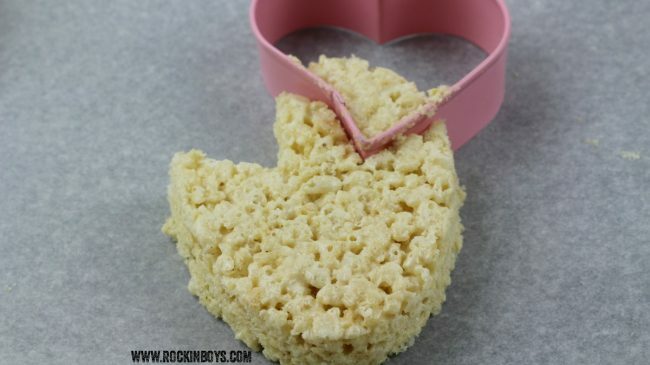 Next, take the bottom of the heart cookie cutter and place it into the upper right side of the foot (see picture). This might take some practice but you’ll get the hang of it after the first one. 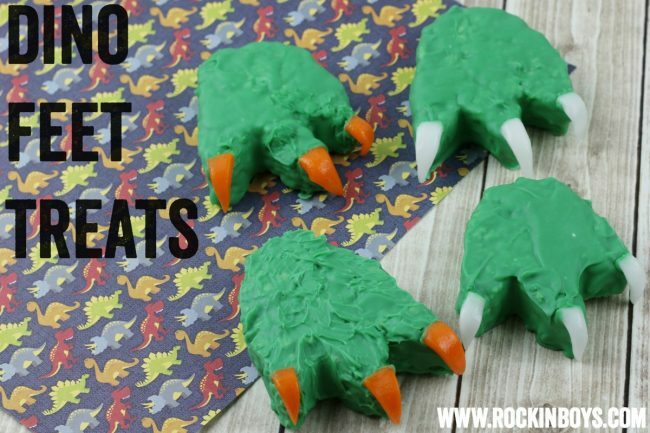 Repeat until you have all your dino feet done. 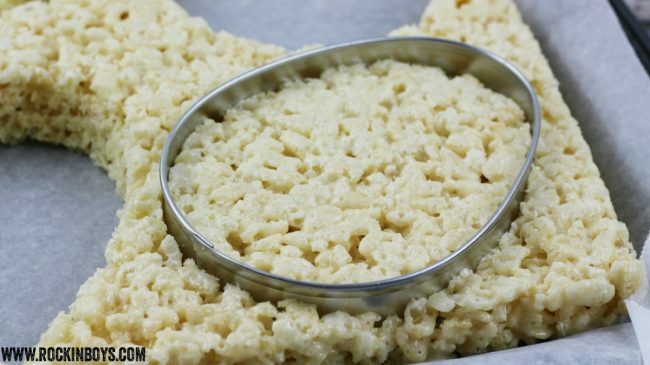 In a microwave-safe bowl, microwave the solid shortening for 45 seconds. 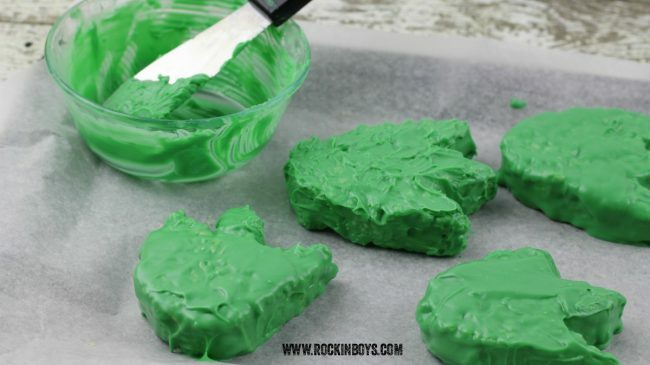 Add the green chocolate candy melts and stir until completely melted and smooth. 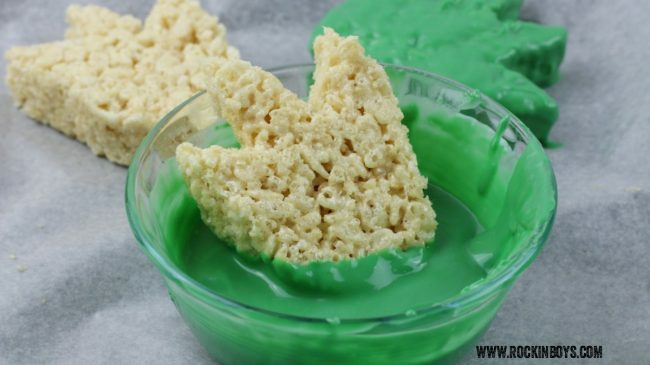 (Depending on the wattage of your microwave, you may have to heat in 10 second additional increments). 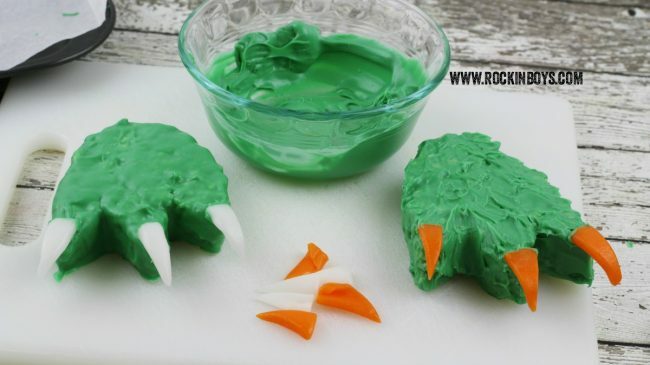 Coat each dino foot with the melted chocolate. I just dipped each bottom into the melted chocolate and then used a spoon to cover the top. It’s okay if they’re lumpy or bumpy, they’re dino feet! 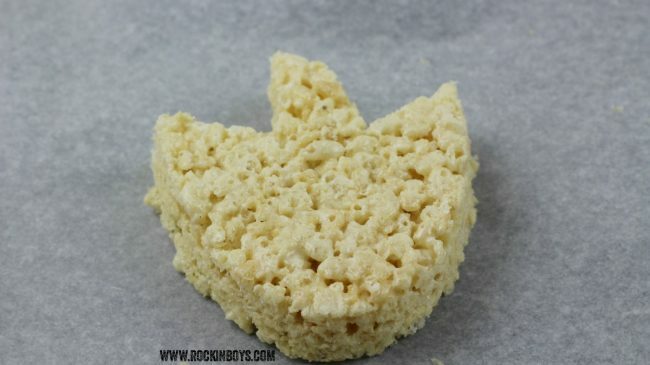 Place back on the cookie sheet for 30 minutes to allow the chocolate to harden. Set aside any remaining melted chocolate to use for the claws. 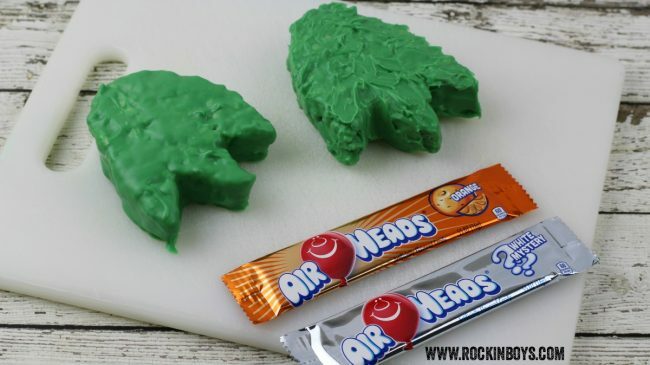 To make the claws, cut each Airhead candy piece into 4 long triangles (see pictures). 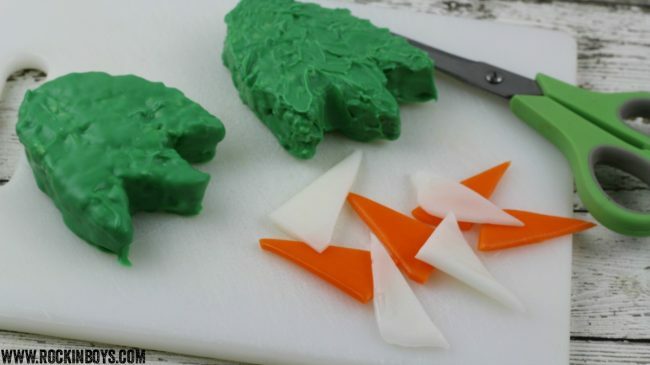 Roll each triangle lengthwise and cut to your desired length. With your fingers, make a curve at the end of each claw. 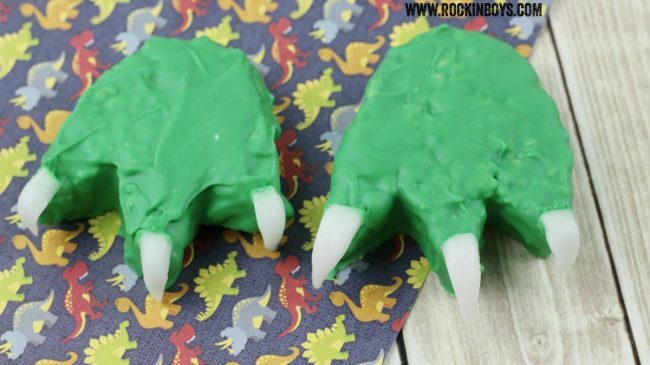 Re-microwave the remaining melted green chocolate until it is smooth, then dip the non-pointy end of each claw into the melted chocolate and gently place on each dino toe. 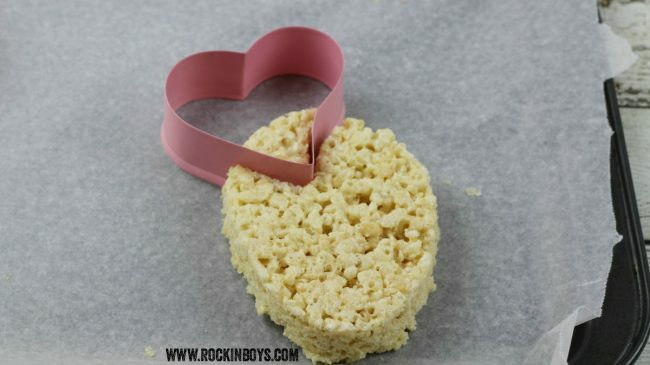 Hold in place for 10 seconds and place back on the cookie sheet. Allow to harden for an additional 20 minutes. And you’re done! 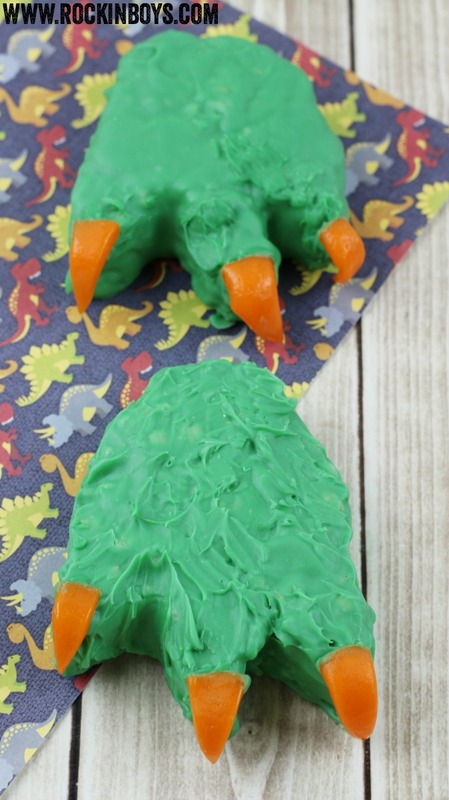 Have a roarin’ good time with these Dinosaur Feet Treats!